Are You Ready for IVMDay? 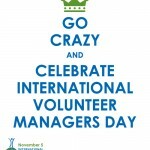 November 5th is International Volunteer Managers Day (IVMDay)! Each year the number of organizations supporting IVMDay grows. The official Web site lists supporters in dozens of countries, from the UK to Fiji, planning all sorts of interesting activities. IVMDay is an opportunity to say thank you to the people who create the opportunities for volunteers and support their efforts every day on the front lines. Just as important, IVMDay is a chance to educate others about our important work, which is why the international committee of organizers encourages the catch phrase "Education through Celebration" each year. Energize, Inc. has started an annual tradition of creating an electronic thank-you card ready to send to your colleagues in volunteer management. See the banners and posters area of the IVMDay site for last year's edition - as well as other colorful materials and logos free to download. Look to our November Update or follow us on Facebook, Twitter, or LinkedIn for our release of the 2013 IVMDay Thank-You Card. 1. Together, your participants view a 60-minute online presentation on a fundamental volunteer management topic...created and presented by a recognized expert trainer in our field. 3. If you wish, Susan or another trainer then joins your meeting LIVE via Skype for a Q&A session! 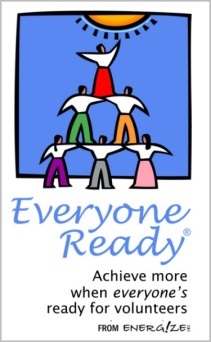 In response to many requests from DOVIAs and other professional associations to access the training modules developed for the Everyone Ready� Online Volunteer Management Training Program, we now have a way you can do it! (You're welcome, program committees!). Download more information and get your session planned today! Volume XIII, Issue 4 of e-Volunteerism, our international, subscription-based journal for informing and challenging leaders of volunteers, launched in mid-July and will run through mid-October. Watch for a new issue on October 15th. Working with Senior Leadership (Volume VI, Issue 4, July 2006) Suzanne Lawson writes about how managers of volunteer resources can build alliances with the senior leadership. Having been on both sides of this partnership, she has many insights that continue to resonate. The Sparking Controversy about Volunteer Internships , in which Susan Ellis and Rob Jackson examine the rapidly growing debate - around the world - about whether unpaid internships (particularly those that are full-time) exploit young people and sidestep labor laws. Become informed and follow the many links to current media stories provided (including ones in which unpaid interns have successfully sued for back pay). Volume XIV, Issue 1 will launch on October 15. Don't miss articles on: the state of volunteer centers today around the world; what makes celebrity volunteers tick; a unique model of hospital volunteering in Australia; Web resources on pet therapy with volunteer support; and more! As always, the contents of the current issue will remain accessible to all subscribers through the online Archives of the journal.